Change up that sunny border or mixed seasonal bed by adding the gorgeous bicolor blooms of World Peace. 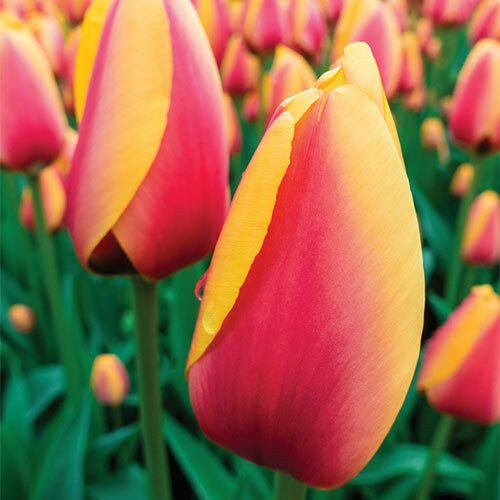 This beautiful Darwin Hybrid tulip features plenty of rich red flowers, all generously trimmed in a lovely golden-yellow hue. Tall and sturdy on 20-22" stems, they look amazing placed toward the back of a border or edging a well-traveled walkway. The classic egg-shaped blooms are large, making them perfect for indoor arrangements, so a heavy planting in the cutting garden is definitely in order. World Peace is tolerant of many soil types, so long as it is well drained. Plant in full sun to part shade for best results.